Carpal Tunnel Syndrome (CTS) is a common form of nerve compression causing numbness and tingling in the fingers. 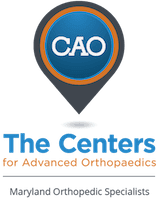 CTS is treated by Dr. Peter G. Fitzgibbons, MD at The Centers for Advanced Orthopaedics: Maryland Orthopedic Specialists Division. Dr. Fitzgibbons performed fellowship-training in hand, wrist, and elbow surgery through the Harvard Hand & Upper Extremity Fellowship based at Brigham & Women’s Hospital in Boston. With locations in both Germantown and Bethesda, Maryland, he and a team of orthopaedists, hand therapists, and physical therapists offer a comprehensive range of services covering the diagnosis and treatment of carpal tunnel syndrome. The carpal tunnel is an area in the wrist through which nine tendons and a nerve run. A combination of tendon swelling, wrist position, and the tendency over time for the tunnel to get tight can cause the blood supply to the nerve to get cut off. The nerve stops working and as result, people can have numbness, weakness, or pain in the hand and wrist. Often this happens at night while sleeping. CTS is diagnosed with a thorough history, a physical examination, and sometimes a nerve test, which is performed by a neurologist. Initial treatment for CTS is usually with a splint that holds the wrist in a position that gives more room for the nerve. Cortisone injections can be helpful in the short-term but symptoms tend to recur. When symptoms are not responding to conservative measures or the nerve compression is significant, sometimes surgery is recommended. What is surgery for Carpal Tunnel Syndrome like? Surgery for CTS is performed as an outpatient procedure and is often done with local anesthesia. During the procedure, a small incision is made, and a thick ligament overlying the carpal tunnel is released. Dr. Fitzgibbons performs most of these procedures at the Massachusetts Avenue Surgery Center, an outpatient surgery center that provides a safe, patient-oriented experience in a friendly and comfortable environment.